The problem is that the "iowait" parameter is returned correctly (see text below the graph), but it is never plotted. On other non-EC2 machines I have never seen this problem. Also there are no error shown in the munin log files. If there's something in there that's limiting the graph to only 200%, look in the munin config files (usually /etc/munin-node/plugin-config or the like) to see if it's accidentally hardcoded. Not the answer you're looking for? 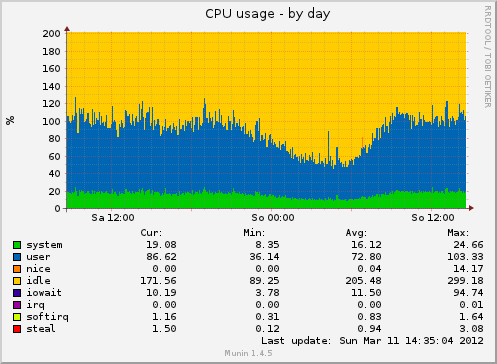 Browse other questions tagged cpu-usage munin graph or ask your own question. Munin-cron fails “Nothing to do”, possibly a munin.conf problem? How to operate the plugin of munin membyuser?